This past match week which ran from January 23rd to the 29th was the first week after the league has split. This was literally a week long match week. There were a number of great performances as Pavel Vorobyev and Radim Valchar played outstanding however Dávid Gyenes the Fehérvár goalie closed the week with four wins, stopped 97% of the shots faced and averaged less than a goal a game, he is this week’s Player of the Week. Dávid Gyenes comed from Miskolc where he come up through the local youth system. He had already been with the senior team during the 2007-08 season but did not make his first pro start until the 2009-10 season. He would go on to split time in Miskolc in the following seasons with goalies such as Dávid Duschek, Krisztián Budai and Bence Bálizs giving Miskolc a strong presence in net. 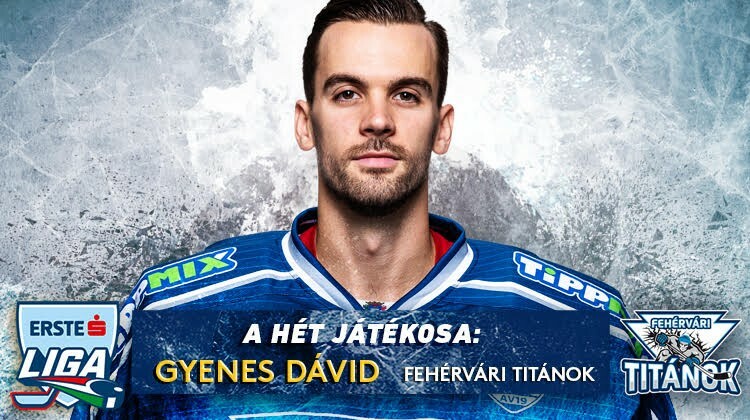 Gyenes was forced to miss the entire 2014-15 season because of an injury and also the first half of the following season. During the 2015-16 season he came on strong at the end of the season and played the entire playoff run where Miskolc ended up winning the league title. Following the season he left his hometown for the first time during his career and spent a season in Debrecen before moving on to Fehérvár. This season he also made his EBEL debut for Fehérvár. Gyenes represented Hungary in two U20 World Championships and made his Hungarian national team debut during the 2012-13 season. The Titánok played four games in a short time, two of which were overtime games and you played every minute, how was the week for the team itself? We can feel that this part of the season is different compared to the regular season. I am very happy that we are able to play and win in so many low scoring games. What is it like to be the oldest Hungarian player in the locker room and to be one of the older players overall? It was strange at first when I arrived to Fehérvár to be the oldest Hungarian player at the age of 25, but I like being in this role and I try to help my teammates when I can with tips based off of what I have experienced in my career. I really do like this. What is the biggest difference between this year’s Titánok team and last year’s? I think that the biggest difference between this season and last season is the team chemistry, the team chemistry is very different even though most of the team is the same from last year. A large part of our team is still in the U20 age group who have played together for the past few years. This can be felt in the locker room and on the ice as well, also the import players are a lot more positive. This can be seen in the work ethic and also during practice. You missed the entire 2014-15 season and the following season with a shoulder injury, what was it like to come back both mentally and physically from the injury? That was a very tough part of my career since I missed over a season. At the start of the 2015-16 just practising as the third string goalie, the team said that I need to come back and be in shape physically, if I can do that they will give me a chance to play and if that happens then I will have chance to more up the depth chart. How much has the level of the Hungarian goaltending changed over the years? The overall Hungarian goalies in the league has not changed, I am thinking of the older goalies such as Dávid Duschek and József Pleszkán, Zoltán Hetényi is also back playing in the league who pulls the level of goaltending up, he is a very good goalie. Now the younger goalies are getting their chance to play such as in Vasas or in HK Budapest. Almost every club has a goalie coach these days and they take time to develop goalies, when we were coming up this opportunity was not there. We can see that goalies are more technical at a younger age as they are coming up. This is all thanks to the goalie training that is going on.